I can’t stand the mall! It’s noisy, crowded, and everyone seems to walk at glacial pace. If I find that I must go, I follow a mission plan much like Special Forces going into a hostile territory (yes, I consider the mall hostile – or at least that’s how it makes me feel by the time leave). I know exactly what I need, and get in, and get out. The only time I may be diverted from my exit strategy is if I happen to see Cinnamon Rolls. (I believe they call this ‘mission creep’). Soft and fluffy bread, ooey-gooey layers of cinnamon and brown sugar, topped with sweet icing – the question then becomes not why the mission creep, but why not?! Clearly I would not do well in a real hostile environment if there was a tasty treat in sight. If you’re like me, and it takes an act of Congress to send you to the mall, or you just want to make your own Cinnamon Rolls, this is an easy and delicious recipe! I won’t sugar coat it (pun intended), it does take some time , about 2 hours to make – though most of that time is inactive (allowing the dough to rise and baking time), but it’s worth it! No hoards of people needed – though you may draw them from the delightful smells coming from your kitchen. Warm the milk in a small saucepan to 110 degrees F. Transfer the milk to the bowl of an electric mixer fitted with the whisk attachment. (Alternatively, you can make everything by hand). Stir in the yeast and add a pinch of sugar. Allow to sit for 5 minutes. While on low speed, add ¼ cup of sugar, salt, eggs, and melted butter - mix until well incorporated. Change out the whisk attachment for the dough hook and while on low speed gradually add the flour. Continue to mix on low speed for 2 -3 minutes. (The dough should be soft and slightly tacky, but not so much that the dough sticks to your hands). 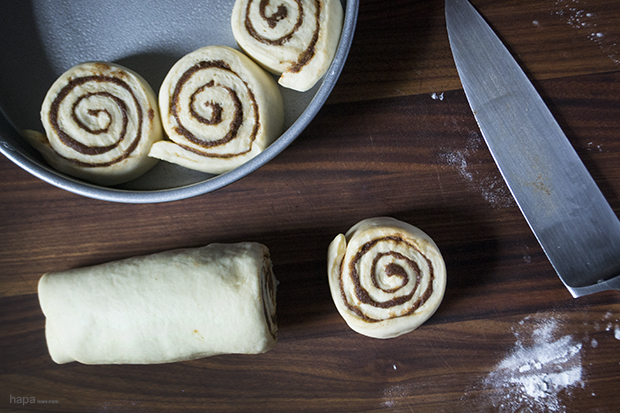 Transfer the dough to a large, lightly oiled bowl and cover with a tea towel. Allow to rise for 1 hour in a warm place, until doubled in volume. In the meantime, prepare the filling. 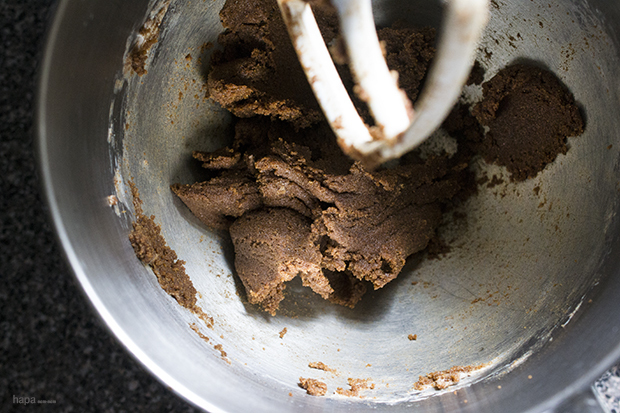 In a clean bowl of an electric mixer, add the softened butter, brown sugar, and cinnamon. Using the paddle attachment mix on medium speed until smooth. To make the icing, add the cream cheese, confection sugar, half and half, and vanilla extract to a clean mixing bowl of an electric mixer fitted with a paddle attachment. Beat on low speed for 3 - 4 minutes until soft. Turn out the dough onto a lightly floured surface and cut in half. 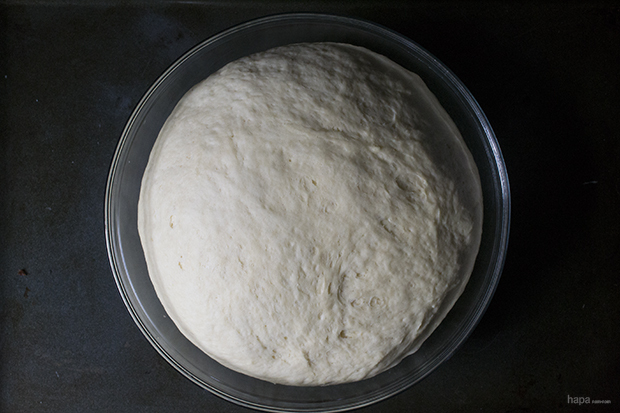 Working with one half at a time, roll out the dough to ¼-inch thick, about 10x17 inches. 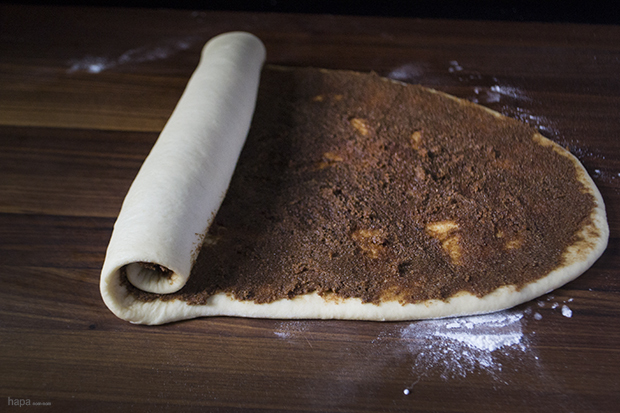 Spread the filling evenly over the dough and then roll up from the shorter side to form a log. Cut the log into 1½ inch sections. Lay the rounds into a lightly oiled baking pan. (It's ok if they're lightly touching, but don't cram them in). Repeat with the remaining piece of dough. Allow the rolls to rise in the pan for 15 - 20 minutes. Bake the cinnamon rolls for 20 - 25 minutes, or until golden brown. Remove from the oven and drizzle the icing evenly over the top. Serve and Enjoy! Bake and Drizzle with Icing. Enjoy! I just took my second batch of cinnamon rolls out of the oven and the house smells heavenly. This is the second batch in about two weeks. We ran out of rolls two days ago and my husband was whining so much that I promised to make another batch today. He declared they are the best cinnamon rolls he has EVER HAD! As disciplined as he is, limiting his consumption to one or two a day, I decided I had better freeze them in serving portions. Guess what! If you put the frozen portion in the fridge the night before and then next morning zap in the microwave for 20 seconds, they are just as good as fresh out of the oven! Now, whenever I will have weekend house guests, they will be treated to the best cinnamon rolls in the whole world! Wow! I’m so flattered that you both enjoy the rolls so much! And it’s great to know that they freeze well! When I make them, they’re usually gone before I can save any – or I send Mr. HapaNom to work with a bunch 😉 I’ll definitely make a note about freezing them – that would be great for people on the go! 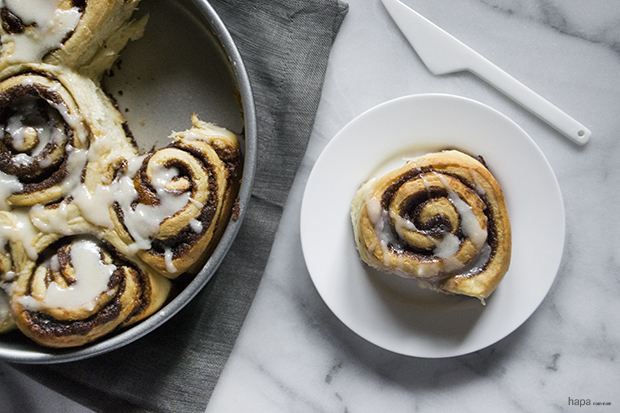 Your homemade cinnamon rolls are so divine! Two hours is well worth it, especially since I can (and will) double the frosting. 🙂 These are picture-perfect! I share your feelings about the mall, too. So frustrating! So … you’ve reminded me that it’s one of my ‘food ambitions’ to make some cinnamon rolls of my own. Pinning this recipe for later! So glad this was an inspiration! I hope you enjoy! THANK YOU for providing the yeast weight! One of the reasons I am hesitate to try recipes using yeast is because “1 sachet” means nothing to me, especially living all the way over here in Australia. You have motivated me to try my hand at baking this weekend. I also love that I’ve finally seen a cinnamon roll recipe made from scratch. 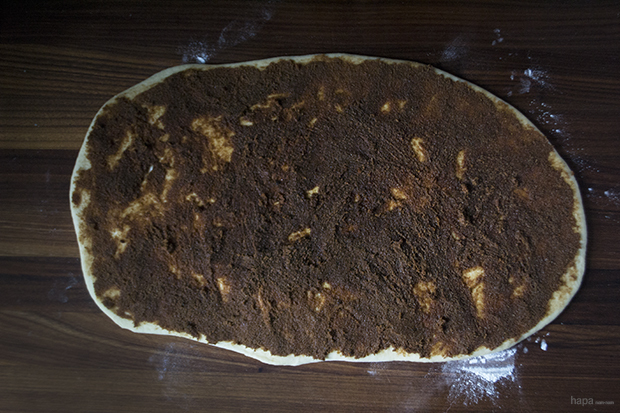 It seems like there are a lot made using crescent bread dough which we don’t have here! I can’t stand the mall either. I’d rather internet shop while eating 1 or 2 of these cinnamon rolls. Great recipe.